Save Water Save Life, Right from the moment, we were in school, we are listening to this phrase. It is so normal, isn’t it? People keep on speaking. 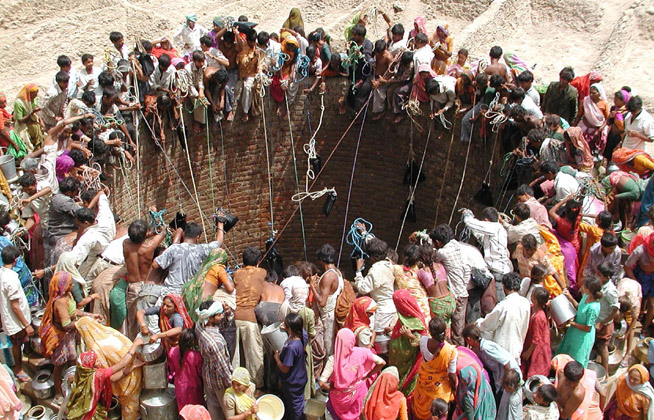 But when I saw images of people climbing step well in Maharashtra for water, images of thousands of birds dying because of thirst, people struggling for every drop of water, it shook me off totally. There was still something left and one fine day in the month of April, when I was taking my evening walk, a pigeon fell down from sky near my foot. Our building people offered him water, he drank and gave up his life. The whole incident alarmed me of the alerting upcoming situation. Other same thing happened, one more pigeon fell down and died. It is just our complex that I saw this, but overall it may be many incidents. During the afternoon hours, I witness 10 to 15 pigeons sitting in my balcony. If we try to make them fly, they have started counter attacking us. Do you know, why so? Concrete jungles made by men have taken away their shelters. Where would they go in scorching heat? Even they need a cool shelter. We were to buy a pigeon net, but my typical Indian parenting stopped me to do that. We were taught in the childhood that whatever belongs to you equally belongs to the other creatures created by God. Never try to interfere in their lives or nature will take a toll against you. Being a single person and with dumb heart people around, I can keep on just informing people about turning off taps. Save water save life, equally holds true for people, who are presently living an abundant life. Today, it is Maharashtra’s turn, tomorrow it will be in our cities and villages. So better be awake. I have laid on self discipline on self to use minimum water in bathing, cleaning clothes, instructing maid to use water as per requirement and no wastage in any way. Just like the way, fire safety equipment are made compulsory in buildings, same way water conservation plants should be made a compulsion by the government. In Surat, there was a huge lake called Gopi Talav (now developed as a recreation place by Surat Municipal Corporation, which is also a state of art) around few centuries back. It had a water holding capacity of lakhs of liters of water. Question would arise that how this lake was filled with lacs of liter of water. Every home of internal city of Surat were having wells. Old wells are very prominent in every corner of the city. Every house has their own rain water conservation system. All the water of the rain were stored in underground tanks or either the wells. All these wells were interconnected and finally connected to Gopi Talav. This way, ultimately, bringing water level high in land. Even today, when any, century old buildings are broken in Surat, they find huge reserve of water underground. A relative of mine excavated the open area of their home and found a continuous flow of water coming horizontally. The flow was so strong and immense that it took them weeks to find the source or stop it. All there efforts failed and finally they constructed a dam like wall to take their construction ahead. Water was immensely clean and pure. I would say people during those times were more alert. They took action after flood and famine. Created a system that got inculcated in lives of water. Just by circulating slogan of save water save life is not going to help, but actually implementing it in regular life. Seeing this scenario, when today we call ourselves technologically advanced can’t we implement such system in our cities? Save water save life, conserve water, conserve trees, let other species also live their lives freely on this planet, can’t we do this much? I always feel that the government should now open there eyes towards nature cycle then progress. What would we do of the progress, if climate is not worth living? What can be a preferred solution to go green, save water, save life? Can we have green pavements rather than cement one? Instead of concrete and iron dividers, which are taking lives in accidents can we have small trees as divider in between the roads? Every builder should be given responsibility of tree plantation upto certain percentage of their construction. A separate document of plantation and their maintenance should be strictly maintained by them. Just like social responsibility is part of corporate companies, tree plantation and maintenance should be part of their yearly tax slab. Our gardens are occupying good space can we have denser gardens in terms of trees? Instead of iron equipment in children corner, can we have old times games in which children area is studded with trees? There are tree houses, ropes hanging from trees, slides and swings are of ropes. Between each and every building there should be one trees. This way we can grow more trees. Tree plantation drive will take place. Trees and greenery are main reason behind depletion of water. Save tree, save water save life.